Gator’s Liquid Gloss is a water based all purpose dressing that restores shine and luster to vinyl, plastic, leather, and rubber surfaces inside and outside your vehicle. You can even use it to finish off the engine compartment by spraying it on the plastics inside the compartment and closing the hood thanks to Liquid Gloss’ self-leveling feature. 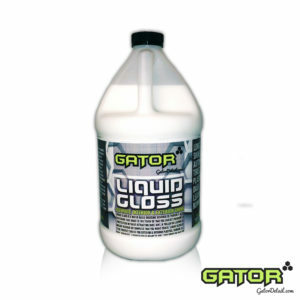 Gator’s Liquid Gloss Water Based Dressing provides UV barrier protection and maintains an attractive luster on the dashboard, door panels, console, exterior trim, tires, leather or vinyl seats, plastic engine components, and rubber weatherstripping. The dressing has a high gloss shine when applied full strength but does not attract dust because it is water-based. Gator’s Liquid Gloss Tire Dressing is the perfect dressing for a Showcar dressing. It’s liquidy white consistency results in a long lasting saTin-gloss finish because it contains the highest quality silicone and without the harsh solvents found in other tire dressings. It will shine and protect tires, as well as any other vinyl, rubber, or plastic surface. Apply Liquid Gloss to tires using an applicator like Gator’s TIRE DRESSING APPLICATOR. Using an applicator eliminates overspray and excess product being applied to the treads of the tire, thus preventing sling. To apply to the interior console, panels, and dash, spray onto a microfiber or foam applicator and apply to the surface. Give the applied product about a minute and you will witness a beautiful, lasting shine that dries to the touch.